The Rescuebird launches from the top of the Rail Rescue Bay, and flies to the Rangers on command. 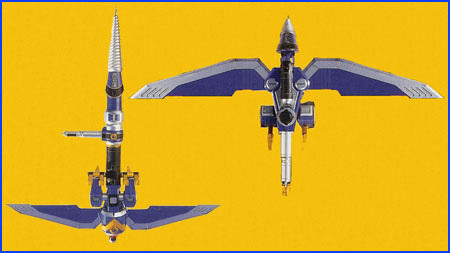 The Rescuebird can be reconfigured into the Unilaser, which combines all Rangers' powers into one destructive blast. It can also be separated into five different weapons for rescue or combat situations - Drill, Laser, Claw, Injector, and Cutter. When separated, each component must be attached to the base of each Ranger's Rescue Blaster.